the canDIshhh tales: Buy 1 Take 1 Swirls Frozen Kefir!! 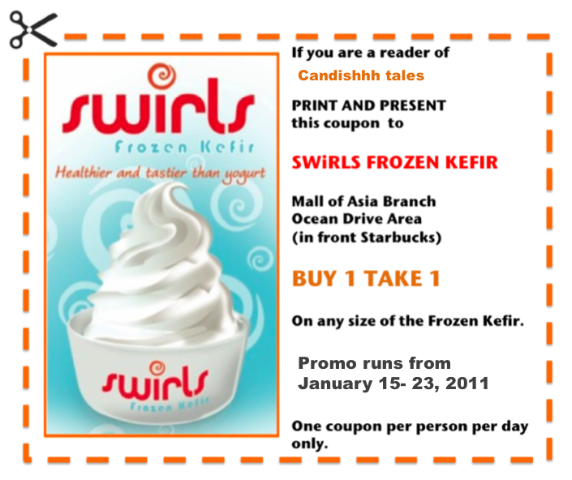 Buy 1 Take 1 Swirls Frozen Kefir!! Kefir is a cultured, enzyme-rich food filled with friendly micro-organisms that balance your "inner-ecosystem." More nutritious and therapeutic than yogurt, it supplies complete protein, essential minerals, and valuable B vitamins. ..but they contain different types of beneficial bacteria. Yogurt contains transient beneficial bacteria that keep the digestive system clean and provide food for the friendly bacteria that reside there. But kefir can actually colonize the intestinal tract, a feat that yogurt cannot match. Kefir's active yeast and bacteria provide more nutritive value than yogurt by helping digest the foods that you eat and by keeping the colon environment clean and healthy. Pan de Manila - WHAT?? Happy Birthday Raffle! Raffle! WINNERS!